“What happens to the drugs confiscated?” This often asked question will get answered on the first of next month when over 1,000 kilograms of heroin, together with large stock of cocaine, Kerala ganja and local ganja scientifically destroyed. 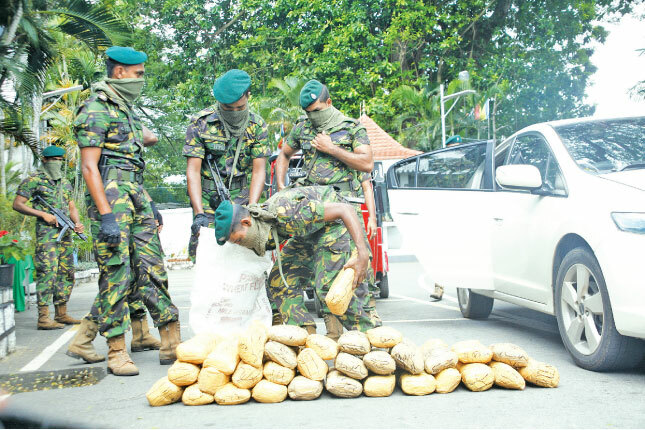 President Maithripala Sirisena said he would personally witness this operation because of his firm determination to eradicate illicit drugs that has been identified as the most dangerous threat that bent upon destroying the future youths of our nation. The drugs, including recently confiscated largest ever stock of heroin and cocaine and Kerala ganja and local ganja (Cannabis Sativa) will be destroyed at the Cement Factory furnace at Katunayake. While heroin and cocaine stocks will be first dissolved in water and the liquid will be totally evaporated in the large furnace at the factory, ganja stocks will be burnt in the furnace separately. This entire process of destruction of illegal drugs will take place in the presence of judges, magistrates, judicial officers as well as the law enforcement officials of Police Narcotic Bureau, Special Task Force, Coast Guards, Customs and Excise Departments and officials of the Presidential Secretariat, Defence Ministry and Presidential Task Force on Eradication of Illegal Drugs. For understandable reasons, there were apprehensions and some suspicions over the detected stocks of heroin and cocaine in the minds of some people. That is mainly due to the belief that rampant corrupt practices were taking place in various institutions including police. Though most of these due to allegations, without any proof, there were certain instances of corrupt practices in police and even in judiciary that were proven in courts. While most of the print end registered electronic media act with utmost responsibility in reporting about the drugs detection and related news, a section of the social media report either highly exaggerated versions or sometimes totally fabricated news. For example, there were Facebook comments that the government reproduced the same heroin and cocaine stocks again and again to show that large scale confiscation of drugs is taking place regularly. It is almost impossible to challenge such fabricated stories and some gullible persons in the society tend to believe such fictional reports. That leads to apprehensions in the society over the confiscated drug stocks. One of the reasons for the misinformation in the society is due to lack of publicity about the destruction of confiscated stocks of heroin and cocaine. A large stock of heroin, cocaine and ganja was destroyed at the Cement Factory furnace on January 23, 2018, but it went almost unnoticed in media. Addressing heads of media institutions, editors of newspapers and directors of electronic media institutions at the President’s House on Wednesday (March 6), President Sirisena announced that a large stocks of drugs confiscated at recent raids will be dissolved and chemically destroyed under scientific methods in the presence of magistrates and judiciary officers at Katunayake on April 1, 2019. The campaign against drug smuggling has produced excellent results during the last three months since taking over of the Department of Police under the President. While the President could keep only two ministries – Defence and Environment – under him under the 19th Amendment to the Constitution, there is no limit as to how many government departments and institutes he could gazette under the President’s Office. Several departments, including the Police, Narcotics Bureau, Special Task Force, Coast Guards, Customs and Excise Departments were involved in the successful raids, detections and confiscation of illicit drugs in recent months. The anti-drugs campaign is not limited to detection of drugs smuggled into the country. Answering a question, President Sirisena said that he had not changed his mind about carrying out Capital Punishment against repeated drug smugglers who continue to indulge in drugs smuggling and distribution while in prison. He said that those who are against Capital Punishment should understand the catastrophe caused to the young generation by these criminals. The President said the police and other agencies have done a good job even without sophisticated technical equipment for drugs detection and promised that the best available technical equipment will be purchased shortly. Already quotations have been called from the United States and Israel, the manufacturers of most sophisticated equipment. When asked about the protests by human rights organisations abroad about the re-introduction of Capital Punishment, President Sirisena asked what those organisations and countries had done to help Sri Lanka to protect the youths and children from the menace of drugs. He pointed out that no country even assisted Sri Lanka by providing sophisticated equipment for detection of drugs. “These equipment are very expensive, each costing US$ 10 to 15 million. Our police narcotic bureau, customs and excise department officers have detected large stocks of drugs though they don’t have such equipment,” he said. “Whatever they say, I am determined to carry out death sentence against criminals involved in drugs. My commitment is to save and protect our youth, the future generation of our nation from this drug menace”. April 1, operation of destroying illicit drugs will be followed by an anti-drug pledge by all the schoolchildren on April 3. It is named as ‘Bakmaha Divuruma’. This pledge is mainly focused at making the youths and schoolchildren aware of the dangers of illicit drugs. The ‘Bakmaha Divuruma’ will also be held at military camps, police stations and public offices and institutions. President Sirisena appealed to the private sector also to get involved in the national endeavour to eradicate drugs from Sri Lanka.